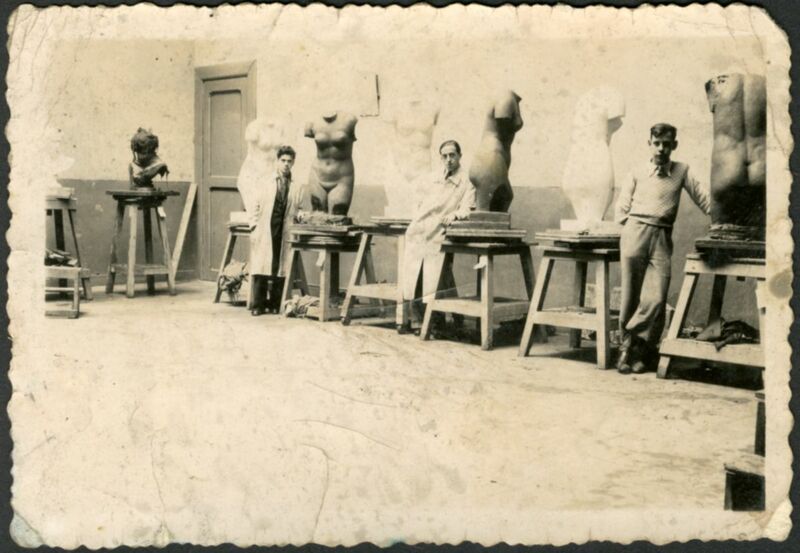 Pictures of the artist Nat Neujean while sculpting ; some of Nat Neujean's early works of art (statues and bronze sculptures); pictures of family members and friends of Nat Neujean, some of whom were members of the armed resistance. In 1923 the Neuman family planned on migrating from Poland to the USA, where a sister of father Isaak Neuman already lived. However, Isaak Neuman then decided to settle in Antwerp together with his wife Sura Lukovska and their daughters Ester Prywa and Bina Rywka Neuman. That same year, in Antwerp, a son, Abraham Nathan Neuman, was born. Three more children would follow : Max, Henriette and Michel. From a young age, Abraham Nathan Neuman showed interest in sculpting. In 1937, he started work as an apprentice in a foundry. In 1941, as a student at the Antwerp Academy the talented young man became a student of sculptor Arthur Dupont. As a Jewish student, Abraham Nathan Neuman was expelled from school a few months later. His mother Sura Lukovska just having passed away, Abraham Nathan Neuman decided to live on his own. He made a living as a technical sculptor and went into hiding after taking on the false identity Nathanial (Nat) Neujean. His workshop at Avenue de l'Orée in Brussels became a safe-house for Jewish and non-Jewish refugees. Via the Belgian Minnie-Minet, Nat Neujean became a member of the resistance, like his brother Max. Abraham Nathan himself was arrested multiple times, but his false papers, his connections in the art scene and his determination protected him from harm. Even during the war, Nat Neujean enlarged his circle of acquaintances in the art scene and he continued to create busts and statues. Nat Neujean's father, Isaak Neuman, his brother Michel, and his sisters Ester Prywa, Bina Rywka (Mina) and Henriette (Sylvie) were all deported via transport V, transport IX and transport XXI. None of them survived. After liberation, Nat Neujean and his surviving sibling Max Neuman tried to rebuild their lives. Nat Neujean kept his pseudonym as a stage name and continued his work as a sculptor. He became a husband and a father, organised exhibitions and has won awards. Nat Neujean donated the monumental bronze "Les sentinelles de la mémoire" to Kazerne Dossin in 2013. The photos in this collection were salvaged by Abraham Nathan Neuman (Nat Neujean) and his brother Max Neuman.